Missed! A Thai student cries in dismay as the projectile from the catapult that he and his team are working on fails to hit the target. He is just one of over 75 middle school students from Samut Prakarn using a disjointed assortment of materials to build a catapult capable of launching an object accurately enough to hit a target placed three meters away. Students watch each other work, and make adjustments to their catapults based on their efforts and those of other teams. All the while, they can hardly believe that this is a science class. But it is. 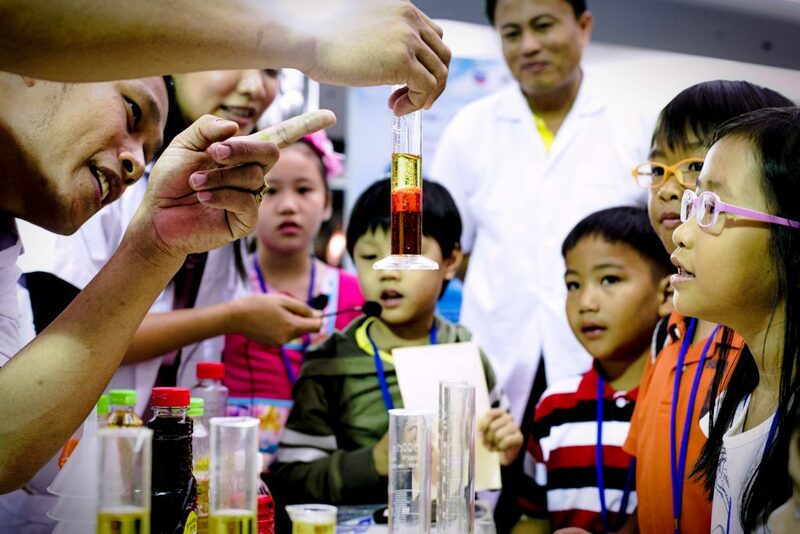 Students are learning science, technology, engineering, and math (STEM) at a STEM Caravan event under the Thai Teachers TryScience (TTS) Project, being implemented by Kenan Foundation Asia. 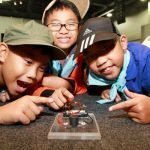 While parents and students have come to realize the importance of studying STEM subjects, they are all too often presented as dull, theory-based disciplines without interesting real-world applications. Recognizing this challenge, Kenan under the Thai TTS Project, recently conducted STEM events in Samut Prakarn and Bangkok to prove to students that STEM is not merely an acronym, but is an integrated learning approach that encourages creative and inquisitive thinking to answer complex problems. The winning team of the “Hit the Target” catapult contest receives their prize at the STEM event in Samut Prakarn. 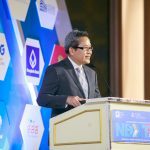 The great challenge of education in Thailand is producing students with strong critical thinking skills, who will then go on to become innovative entrepreneurs, engineers, technicians, or computer programmers. Because Thai schools tend to focus on rote memorization, the system fails to produce enough graduates equipped with the necessary STEM knowledge and critical thinking skills needed by today’s workforce. This limited workforce capacity, in turn, hampers the nation’s industrial development and overall economic growth. 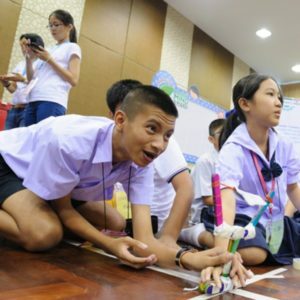 During STEM Caravans, also held in Samut Prakarn and Bangkok, over 50 high school students had an even more challenging time, applying technology to create their own computer applications under the tutelage of IBM corporate volunteers. This required students to utilize their STEM knowledge, as well as computer programming skills in order to address real-world problems. 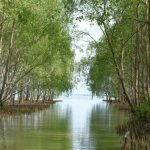 “I decided to develop an application to monitor body heat,” said Thanapat, a 12th-grade student from Bangkok’s Wat Intharam School. 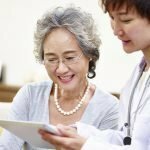 “The application sends the data to a mobile phone or computer, so people can be notified when their body heat is too hot or too cold. 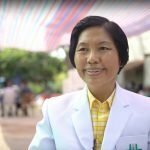 This allows people to quickly recognize health issues without time-consuming trips to the doctor.” By actively engaging students through exciting, project-based learning activities, the events offered a different approach than the teacher-centered learning that characterizes most classrooms in Thailand. An expert teaches students about the importance of internet safety and security. 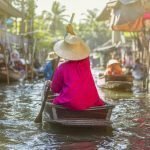 Thai TTS is more than just fun-filled learning events for students. In addition, Thai TTS supports teachers through professional development training and resource mobilization. 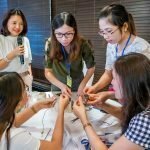 Utilizing localized versions of the Teachers TryScience materials, a collection of lesson plans and instructional videos developed by IBM and the New York Hall of Science, Thai teachers are trained in how to deliver thought-provoking project-based learning activities in their classrooms. To date, Kenan trainers using Thai TTS have built the capacity of 30 master teachers and provided training to 450 teachers from 10 schools in Bangkok and Samut Prakarn. These efforts will ultimately benefit over 2,000 teachers and 45,000 students within the TTS school network. Building an educational infrastructure capable of producing graduates with strong STEM knowledge and critical thinking skills is a task Kenan are tackling head-on. The TTS network aims to serve as a model that other areas of Thailand can follow to create dynamic learning environments.